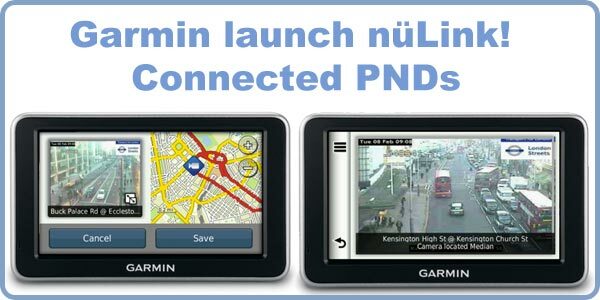 Today Garmin announce a new range of PND SatNavs. Called n�Link! the range has 3 models: the 2390, 2340, and the 2320. What differentiates these GPS devices from the previous Garmin products is the 'Live' functionality. The new PNDs include a cellular connection allowing the transfer of data from the Garmin servers to the PND. This allows Garmin to send and receive up to date traffic and other data allowing the driver to be kept aware of the latest road conditions. There are 3 main areas of interest in the new N�Link! devices: 3D Traffic, Garmin Tracker, and Cyclops Speedwatch. The Garmin 3D traffic service is a combination of conventional probe and editorial traffic information, and live traffic cameras. How often do you have traffic reports that are not as accurate as you would like? I know I get lots even with the best the competition can offer, but knowing that there is a problem is not useful unless you can make an informed decision what to do about it. Well seeing is believing and Garmin's new Photo Live Traffic enables you to see exactly what the traffic conditions are and allowing you to decide how to avoid them. This has been achieved by partnering with the Highways Agency (in the UK), and other authorities across Europe to geo-reference all the traffic cameras on the road network and provide live images to the PND. You can even configure the start screen of your Garmin to show you your 'Favourite' cameras when you switch it on. This will allow you to check your route to work as you set off. Clive Taylor Garmin's Product and Marketing Director told PocketGPSWorld.com " Some people do not believe in the traffic information they are given, but with Photo Live Cameras seeing is believing!" Garmin Tracker is a Technology developed from the Garmin GTU 10 system and allows the user to provide your current location (by invitation) to friends, family or others. This feature is called follow me and can be configured to authorise someone to see your location from a computer connected to the Internet. This permission based service can even be configured to allow someone to follow your movements for a set time period ie 24 hours. The system will also include Cyclops SpeedWatch speed cameras. Users can report camera locations live and get updated camera locations as they are driving. The Garmin Live services also include fuel prices, dynamic parking, weather, flight tracking, and Google Local. There is also a send to GPS feature to transmit a location from your computer to the GPS. The models are differentiated mainly by mapping. The 2320 has regional mapping, the 2340 has Western Europe maps whilst the 2390 has full European maps. The flagship 2390 also has Advanced Speech Recognition which allows you to issue voice commands to control the device. Good news is that, unlike some competitors, Garmin still allow the import of 3rd Party POIs. This means that the PocketGPSWorld.com speed camera POIs will load onto the device and still give their proximity warnings. The new Garmin 23xx devices all come with a one year to full live services. Prices for the 2390 are �229.99 and should be in the shops early June. We are currently awaiting the official Garmin press release and will add it as soon as we receive it. Garmin, the global leader in satellite navigation, today announces the next generation of Live sat navs, the n�Link! 2300 series with enhanced 3D traffic and PhotoLiveTM cameras. The n�Link! 2390 brings top-end live navigation features with new Garmin 3D traffic which consults over 80 million expert traffic sources across Europe to ensure the best traffic avoidance and live traffic information available. As soon as the n�Link! 2300 units are turned on you are able to check the traffic conditions on route including any of the live traffic cams along the way. The 3D traffic pulls together information from millions of live traffic sensors and expert sources as well as live radio reports to ensure the most accurate information at any time of the day. In addition to the traffic reports and approximately 1600 live cameras at key congestion points across the country, the n�Link! 2300 units also receive traffic hazards and incident reports, such as debris on the road or vehicles travelling the wrong way along major routes. The 4.3� widescreen touch-sensitive display with a new enhanced user interface allows the user to customise what is important to them. They can also report speed limit errors and safety camera locations, which are fed back to the Garmin community so other users may benefit. The �Speedwatch� safety camera information is part of a wider Speedwatch community supported by safety camera specialists Cyclops, enabling you to be instantly aware of both fixed and mobile cameras along your route. The Garmin n�Link! 2300 units have additional live content such as Google� Local Search, weather radar, fuel prices, currency exchange rates, airport arrivals and departure times and a host of other Garmin n�Link! applications to keep drivers up-to-date with what�s happening to help make timely decisions. If you also want to make sure your loved one arrives safely, the n�Link! 2300 units have, by invitation only, a built-in tracking system that can be tracked on the web, or posted to popular social networking websites or on another nuLink! 2300. This helps to reassure users that if anything does go wrong they will always be able to be located via the Garmin tracking application. There are also millions of points of interest (POIs) pre-loaded with information on shops, garages, parking and places to visit. This is on top of the billions of locations available through Google� Local Search though which users can now explore their surroundings and find shops and services in an unfamiliar area. The n�Link! 2390 also has Garmin�s advanced Automatic Speech Recognition (ASR) technology, which allows the driver to call it a name and then activate the sat nav with this �wake-up� name before going through the menus by just using their voice. This means drivers can keep both hands on the steering wheel while searching for destinations or changing settings. Another safety feature is the hands-free Bluetooth�* wireless technology which enables hands free calls with compatible mobile phones. The n�Link! 2300 units also speak street names, driving directions, guide drivers into the correct lane and have Garmin�s exclusive PhotoRealTM Junction View showing actual junctions that have been digitised to look like the junction you should be looking for. These are shown via a split screen to ensure you can continue navigation and see the junction manoeuveur ahead. ecoRoute� also helps to reduce fuel consumption by giving advice on careful driving and greener journeys. Paired with fuel price information this can also save you significant money. Also, with n�Route� technology, intelligent programming predicts favourite routes even before you set off, saving time when the sat nav is first turned on. The new n�Link! 2300 also come with applications such as Park Position Recall, Audiobooks, or additional cityXplorer� maps for walk-about and public transport information. Garmin believe that the new n�Link! 2300 takes live connected navigation to a new height, setting the next bench mark for the future. The n�Link! 2390 has mapping for all of Europe. In addition it is equipped with ASR (Automatic Speech Recognition). The PhotoLive part of the package seems to be just a trial . Do you have any more info on the exact terms of this trial and the costs of having it as a permanent feature? It's my understanding that they are a part of the live services and so you get one year subscription with the device. I don't have costs for subsequent years as yet. Confirmation, its a 30day trial and then costs �3.95pm. In which case it's even more of a white elephant than I'd thought!